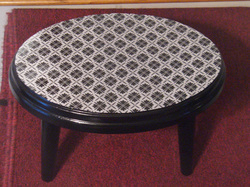 This charming stool is made of wood and composite materials and has a black satin finish with a black/white print on the top surface. 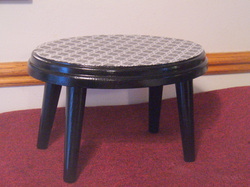 The entire stool is covered with a protective sealant. It measures approx. 8.5" H x 10" W x 13.5" L Equally at home in both a modern or traditional decor, this versatile stool can also double as a plant stand. It can be used outdoors in a protected setting such as under a roofed porch. $15.00 plus shipping. Your order will be shipped the next business day via parcel post with delivery in approx. 7 to 10 days. I'm still under construction ~ Please check back, more items to come!